Yannick Sagbo and Benoit Assou-Ekotto have been granted more time to respond to Football Association charges relating to the quenelle gesture. The Hull striker and QPR left-back were charged with improper conduct last week for referring on social media to the offensive gesture made by Nicolas Anelka during a Premier League game. The pair, originally given until 8 April to respond, asked for more time. What is a quenelle gesture? The FA has agreed but the new deadline has not been made public. Anelka was sacked by West Brom last month after being given a five-match ban for the gesture. The 35-year-old former France international is now on the verge of joining Atletico Mineiro, according to the Brazilian side's president. The quenelle, an arm gesture widely considered to be anti-Semitic, came to prominence in the UK after it was performed by Anelka while celebrating a goal for West Brom in December. 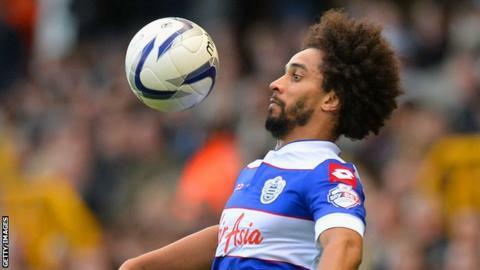 Assou-Ekotto, 30, is on a season-long loan at Loftus Road from Tottenham. He became involved after tweeting in response to Anelka's salute a message that translated as "I congratulate you on the beautiful quenelle". Ivory Coast international Sagbo, 25, also took to the social media network after the incident, posting a picture of Anelka's celebration with a message of support for the striker and comedian Dieudonne M'bala M'bala, who has popularised the gesture.